The Powerhouse is an informal learning environment where visitors learn by doing, by wondering, and by experimenting. We strive to move the student beyond simple acquisition of information to application, synthesis, and evaluation. The information on this page will help ensure that your time is productive, enjoyable, and in line with your curriculum goals and objectives. Fun and Engaging Powerhouse Experiences! A field trip to the Powerhouse Science Center is a fun, memorable, hands-on science adventure that we’re sure your students will never forget. All of our STEM lessons, demonstrations, and activities are linked to Colorado and Durango 9R Academic Science Standards and can be adjusted and modified to meet any standards and learning goals. We want to promote a positive experience for all visitors at the science center. 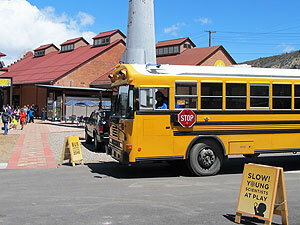 Due to our small facility, we need to limit the number of students visiting to no more than 60 per field trip. We can make special arrangements for a visit with more than 60 students at an additional cost. We ask that you please bring at least one chaperone for every 15 students. All chaperones and teachers are welcome free of charge. The STEM Station Labs are student-centered designed to introduce or revisit science concepts to students. *Teachers must bring a minimum of two chaperones as this option is not facilitated by The Powerhouse staff. To book email education@powsci.org or call (970)259-9234 x106 to see a list of lessons and themes and book today! Some popular themes include: Dissections: eyeball, heart, squid (yum calamari), or grasshoppers, Energy Transformation, Matter Matters, 1,2,3 Blast Off!, Programming with Lego Robotics, Build Art Bots, CSI 101, Rube Goldberg Contraptions, Circuitry, Water Science, Goldilocks Planet, Electromagnetic Spectrum, and MUCH MORE. Browse the calendar below to see if your desired date and times are available. Then request your trip by filling out the form below. Our Education Director will get back to you regarding themes and details of your trip. Questions can be directed @ (970)259-9234 x106 or emailing education@powsci.org. At least one-week advance notice is required for invoice modification or reimbursements if participation numbers change. Energy, electricity and science education for rural students! Thank you Empire Electric Association, our Montezuma county partner, for funding field trip visits to the Powerhouse.